Swami Muktananda (1908 - 1982) began the life of a sadhu, a wandering mendicant in search of spiritual fulfilment, at an unusually early age. Though as a young man Muktananda gained recognition for his yogic attainments, Swami Muktananda often said that his spiritual journey didn't truly begin until he received shaktipat, spiritual initiation, from the holy man Bhagavan Nityananda. It was then that Muktananda's spiritual energy, kundalini, was awakened, and he was drawn into profound states of meditation. Nine years later Muktananda attained the state of God-realization. In the 1970s, on his Guru's behalf, Swami Muktananda brought the venerable tradition of his master's lineage to the West, giving the previously little-known shaktipat initiation to untold thousands of spiritual seekers. 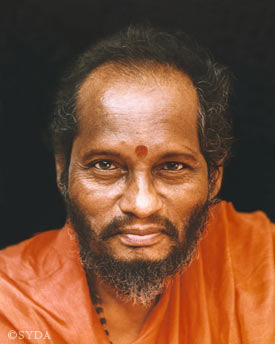 Muktananda established Gurudev Siddha Peeth as a public trust in India to administer the work there, and founded the SYDA Foundation in the United States to administer the global work of Siddha Yoga meditation.